"The Insult" may not be based on a true story, but it could be. Set in today's Lebanon, it shows how, because of years of unspoken frustration and resentment, a tiny incident could spiral into a nationwide uproar. It is the sad testimony to the limitations of the human condition, trapped between religious sectarianism and historical movements. It is set in the Middle East, but it could equally be about any other human society in turmoil, where people have made old grudges a part of their identity, and feel righteous hating an entire group of "others" they barely recognize as human. The movie ends with a glimpse of hope, when the two main protagonists can finally at last acknowledge the human condition of the other. To enjoy this movie, it might be helpful to recall a bit of contemporary Lebanese history. Trapped between the Mediterranean Sea, Syria and Israel, Lebanon - which has been independent since 1946 - has been caught in the middle of the Israel-Arab wars, and wave after wave of Palestinian refugees have streamed into Lebanon since 1949. The movie only presents two groups from this multicultural country, the Christian Lebanese and the Palestinians. Christians represent about 40 percent of the total population; Muslims represent 54 percent, half Sunnis and half Shiites. Approximately 10 percent of the population is Palestinian (in recent years many have tried to immigrate to Europe), still living in camps, and rarely given a Lebanese citizenship. Yasser, one of the two main protagonists, lives in a Palestinian camp near Beirut and works as a construction foreman in the capital. The name of the camp where he lives is not given, but many still remember the Sabra and Shatila massacre in 1982 when hundreds if not thousands of civilians were killed by a Lebanese Christian militia, under the eyes of their Israeli allies. So when a minor disagreement erupts over a leaking gutter, and Toni, the Christian Lebanese, tells Yasser that Ariel Sharon (then Israeli prime minister) did not kill enough Palestinians, the verbal challenge between the two men comes to blows. When one of the men ends up in the hospital, he decides to take the other to court. As the two adverse lawyers battle in the courtroom, important elements of the past between the two families are revealed, peeling layer after layer the difficult recent history of a country that was once a land of peace, the Land of Cedars where it felt good to live. The courtroom portion of the movie includes all the ingredients of this genre: tension, emotions, unexpected revelations, and doubt about who is right and who is wrong. The two main actors are totally credible, each playing in contrasting registers, the contained Palestinian and the furious Christian. The movie does not take sides at any point. It tries to shed a light on a painful truth that has been buried under years of silence. For example it reminds people of the Sabra and Shatila massacres, but also of the 1976 Damour massacre when hundreds of Christian civilians were killed by Palestinian militia. 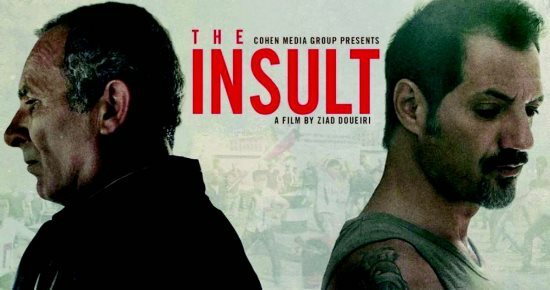 Ziad Doueiri, who directs this movie, is not afraid of tackling difficult cultural issues, as he did in 2012 with "The Attack," where the wife of an Arab Israeli surgeon blows herself up during a terrorist attack. The well-mastered movie was rightly selected for the Academy Awards in the Foreign Language Film category. It was very well received in Lebanon because it brought the difficult relationship between Christian Lebanese and Palestinian refugees out into the open, as well as the open wounds left by the 1978 civil war fueled by Syria and Israel, where Christians, Sunnis, Chiites and Druzes groups tore at each other. It contains a lot of food for thought closer to home as well. 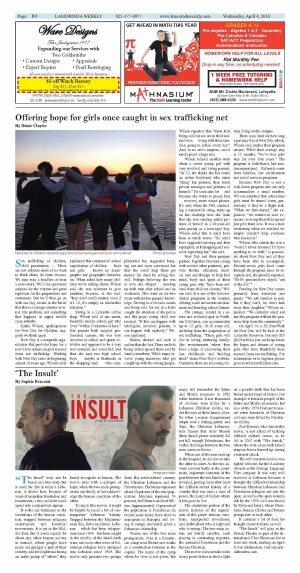 "The Insult" will play at the Orinda Theatre as part of the International Film Showcase for at least one week, starting on April 6. For information, visit www.lamorindatheatres.com.